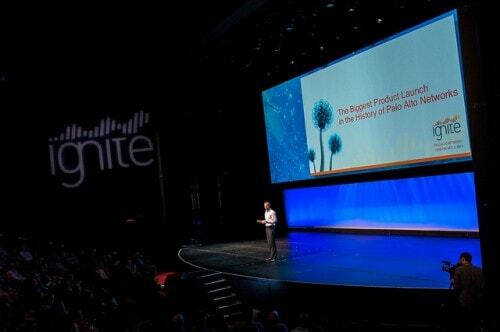 At Ignite today, Lee Klarich, Palo Alto Networks’ VP of product management got up on stage in front of about 800 people and described the biggest product launch the company has ever done: three new platforms, 2 new services, and over 60 new features. There is obviously a lot to talk about, but I wanted to focus on a couple of things in this blog entry – two new next-generation firewall platforms. First, the big news: the VM-Series virtualized next-generation firewall platform. There are three models – I won’t go into detail, as you can get that from our website. But the important thing here is that enterprises can now get the same level of network security Palo Alto Networks is known for both inside, and outside the physical machine, with all of the features that our physical appliances have. This is a key component in a comprehensive approach to network security in the virtualized data center, which enables organizations to do all the network security things they need to do in the data center, while addressing the virtualization-specific issues like east-west traffic, tracking VM movement, and keeping pace in an automated and dynamic environment – all with a single management and policy construct, and a choice of virtual and physical enforcement points. The other new next-generation firewall platform is the PA-3000 Series. Two models, the PA-3020 and the PA-3050, fill in the mid-range of our hardware portfolio. I think about it as the new Toyota Camry or Honda Accord of Palo Alto Networks next-generation firewalls – right sized for many organizations, full-featured for network security and safe application enablement (focused on applications, users, and content), and architected with the same eye toward performance and availability enterprises have come to expect in our firewall hardware. These two new platforms would be news by themselves, but as I mentioned, this was a pretty big product announcement that we made. More on the launch to come!